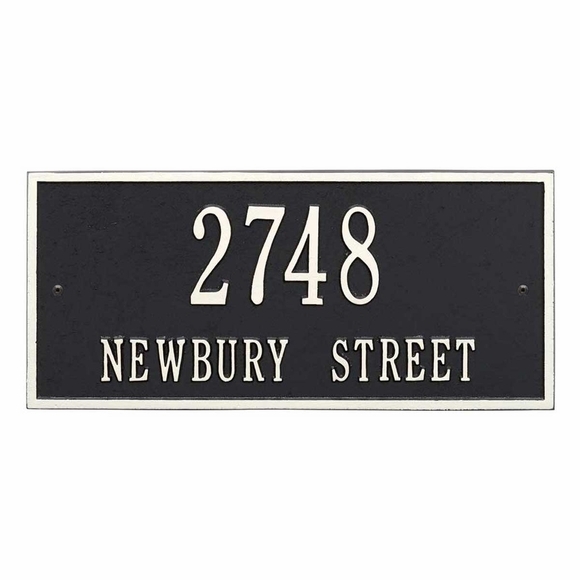 Rectangle Shape Address Sign - - 16" x 7.25" residential address plaque holds one or two address lines. Wall mount. Made in USA. The one-line sign holds up to five (5) 4.5" numbers. Colors (from left to right in small images): BG black with gold characters; BS black with silver characters; BW black with white characters; OG bronze with gold characters; PS pewter with silver characters; and WH white with black characters (not shown). Rectangle Shape Address holds one or two address lines. Wall mount.